Due to v1.A2.exe giving false-positives with some AV software and causing users problems, I have decided to release v1.A3 early which I hope will give less trouble! New \grdlr grub4dos 2018-09-19 (no bug fixes, just extra functionality). Bugfix QRUN.g4b for .jpg/,bmp wallpaper file extension - if an animation was running then selecting a .bmp or .jpg file did not change the wallpaper. Warning added if Windows 7 .imgptn file has the bootx64.efi boot file missing. \_ISO\docs\Make_Ext\Make_Ext.exe utility added - allows you to make persistence files without needing RMPrepUSB. QRUN now displays contents of the \.disk\info file just before running an ISO (if it exists). SWITCH_E2B.exe re-packaged so will not trigger false-positives with AV software and file sync.exe removed. Comments changed in Sample .mnu files to add a mention of the Make_Ext.exe utility which is now available as well as RMPrepUSB. Let me know if this version gives you any problems. I will put it on the main website in a day or two as soon as I get some feedback. 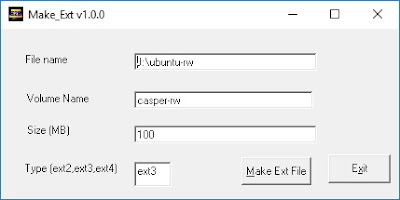 The latest Beta version now includes the new Make_Ext.exe utility which will make linux persistence files on your E2B USB drive for you. This means you do not need to have RMPrepUSB on your PC or the USB drive. The \_ISO\docs\Make_Ext folder contains the utility + support files. Note: v1.0.0 had a bug and did not always format the file to ext format (you can tell because it runs very quickly!). Please use v1.1.0 which can be found in E2B v1.A4 and later versions. The symptom is that if you attempt to mount the ext file, linux will complain about a bad superblock, etc. E2B allows you to boot Windows Installers via UEFI. However, you must first convert the Windows Install ISO to a .imgPTN file if you wish to UEFI-boot from it as well as MBR-boot. This means that you must convert each Windows Install ISO to separate .imgPTN files. However, there are ways to perform UEFI installs directly from Windows ISOs. If you first MBR- or UEFI-boot to a Windows PE .imgPTN file and your Windows ISOs are on a second partition, you can use WinNTSetup or Windows Setup.exe to install Windows. The WinNTSetup process has the advantage that you can boot to either a 32-bit or 64-bit WinPE and install either 32-bit or 64-bit Windows to the target hard disk. The Windows Setup.exe process is simpler, but you must boot to WinPE32 to install 32-bit Windows or WinPE64 to install 64-bit Windows. Apparently, the new self-extracting Switch_E2B.exe in v1.A2 is triggering false-positives on some AV engines. I have re-packaged it in 1.A3a Beta and hopefully it will cause less false-positives. Please let me know if this new version of Switch_E2B.exe is any better if you had problems with the v1.A2 E2B version. I will update 1.A2 to 1.A3 if it fixes the false-positive issue. I think that this version has all the changes required now, so please try it. Then any .imgPTN file that you make should have a German menu. I think one line still requires translation though. 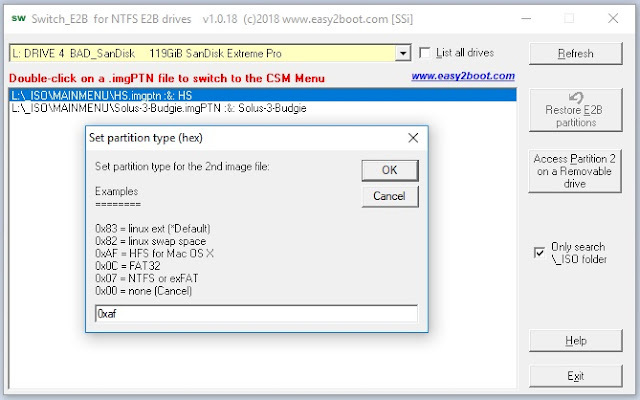 http://www.easy2boot.com/configuring-e2b/csm-menu-changes/ has details of how to modify the MyCSM.cfg file further if you wish to change the menu appearance. See the previous blog for more details. The CUSTOM folder contains a Sample_MyCSM.cfg to help you. If you want to make a language file in a different language, please feel free to try adding a new language. Note that you should not change or add any files under .\csm in the MPI download folder, instead always add extra files to the .\CUSTOM folder - these will overwrite any other files of the same name and will be added into any new .imgPTN file. Let me know if you have tested this and any comments too. This is an experimental version for testing. I have modified the menu.lst file so that the CSM menu will support other languages. At the moment however only English is available. Beware! Windows Explorer's handling of .zip files is buggy! Tim contacted me today to make me aware of a problem with Windows 10 Explorer's handling of .zip file extraction. He told me that he had a problem when using WSUS Offline Update. He downloaded the .zip file onto the \_ISO\WINDOWS\installs\ folder but when he tried to use WSUS, he found it would not work correctly because Windows Explorer had changed the modification date of all the extracted files. This v1.A2 version fixes a few small bugs in v1.A1 and previous versions. Bug fix for SUB_MENU_Maker.cmd adding space to .mnu file and prevents background wallpaper from being loaded for new user-made menu folders. Special characters now should work and a UTF-8 .mnu file is written when using .cmd files (E2B MNU Maker.cmd, E2B SUBMENU Maker.cmd, E2B TXT Maker.cmd, SUB_MENU_Maker.cmd). If the MFOLDER value has extra spaces on the end, these will be automatically removed. Small tweaks to F1.cfg help files. Add DOS menu to FreeDOS disk image so can boot it in different configurations. Two long-standing bugs have been reported in the SubMenu Maker .cmd script. When the .cmd script is used, to make a .mnu file, it puts a space character at the end of the line, e.g. This can cause problems (e.g. when adding a wallpaper file at \_ISO\NEW.jpg). Also, any special characters, when input by the user (e.g. Ü) are not converted correctly when using the .cmd scripts. I have attempted to fix this by using a code page setting of 65001 just before writing the new .mnu file. v1.A2b Beta can be downloaded here. Please try the new .cmd files and let me know if there are any problems with your language or Windows version. My latest eBook, 'How to install Microsoft Windows using Easy2Boot' is now available here (downloadable as a PDF file). This is now the fully released version 1.00. It mainly covers Window 10 installs but the same techniques can be applied to most post-Vista Windows install scenarios. Note that the installation of Windows XP is not covered in this guide. There are even a few jokes hidden inside it, just to make sure you are awake! This new eBook assumes you are already familiar with E2B. I have made a small change to the released version of E2B v1.A1 before I make it live on the E2B website. It now has a new version of SWITCH_E2B.exe (which you may find useful if you are into dual-partition image sorcery!). This new version will prompt you to enter a partition type number for the second partition image, if SWITCH_E2B does not recognise the partition type of the second image file. Previous versions of SWITCH_E2B would have set a type number of 0 (no partition). This new change means that you can switch in dual images (e.g. HighSierra.imgPTN + HighSierra.) and set the second image to be an ext partition or HFS partition, etc. so it is visible to an OS. This means that you do not need to boot to the CSM menu first so that the CSM menu code sets the partition type - thus you can use Switch_E2B to switch partitions and then UEFI-boot immediately. 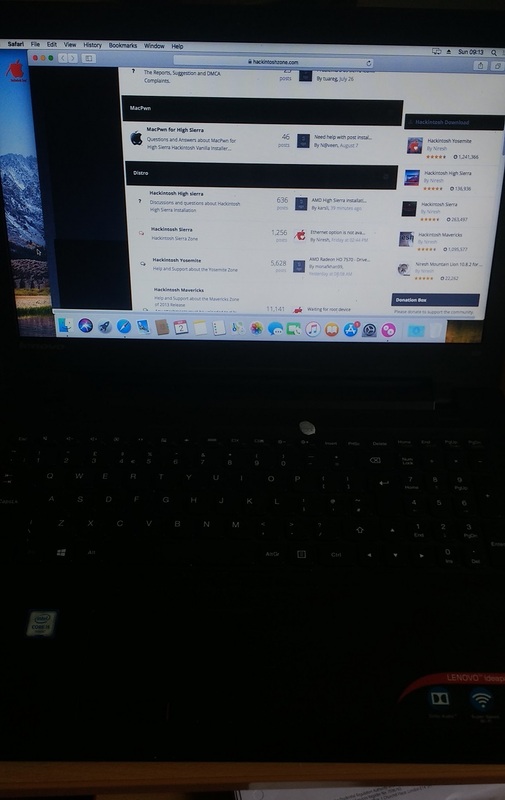 I have managed to get the Hackintosh High Sierra installer working on my E2B drive and successfully installed it onto my Lenovo IdeaPad 300 (at least the Desktop, Enet, kbd and touchpad work)!. As usual, I will delay updating the E2B website with this latest version for a few days, so if you find a problem after updating your E2B drive with v1.A1, please let me know ASAP!